Michael Burke was born in 1865 in Tipperary, Ireland, son of Thomas Burke, a farmer, and his wife Annie, née Quirke. In 1899 at Sydney he married Lucy Agnes Lloyd (d.1962, aged 89) and had one son and five daughters. He died on 16 July 1937 at Summer Hill and was buried in the Catholic section of Rookwood Cemetery. Michael Burke arrived in NSW in 1887 and worked as a labourer. He was later employed by the Sydney Harbour Trust. He became a member and an organiser of the United Labourer’s Union and a delegate to the Trades and Labour Council. He was a foundation member of the Labor Party and was a member of its Central Executive from 1904 until 1913 and again from 1915 until 1917. In 1910 he was living at Miller Street, Pyrmont. Burke was commissioned as a Justice of the Peace in 1913. Burke was elected MLA for Belmore, 1917-20, for Sydney, 1920-22 and 1925-27 and for Phillip, 1927-30. 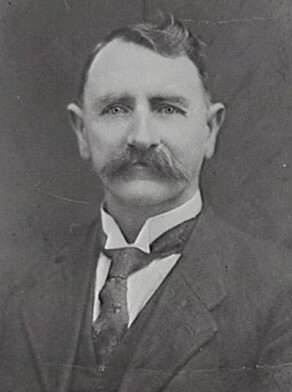 Michael Burke was Alderman for Denison Ward, 1 December 1909 to 1 December 1912 and for Pyrmont Ward, 17 September 1913 to 31 December 1927. He was a member of the Works Committee, 1911-26, the Health and By-Laws Committee, 1911-13 and 1927, the Finance Committee, 1914-26 and the Electricity Supply Committee in 1927. City of Sydney Archives: Aldermen’s Files; Photos: CRS 54/109, 54/168, and 54/238.